I tried to curb my curiosity and not tear open every hive I have during our few days of sun. Showing uncharacteristic self-restraint, I chose two whose meager traffic concerned me, and two very populous ones. One of the worrisome colonies, previously large and well-provisioned, had dwindled alarmingly. Two weeks ago they were bringing in pollen with gusto. 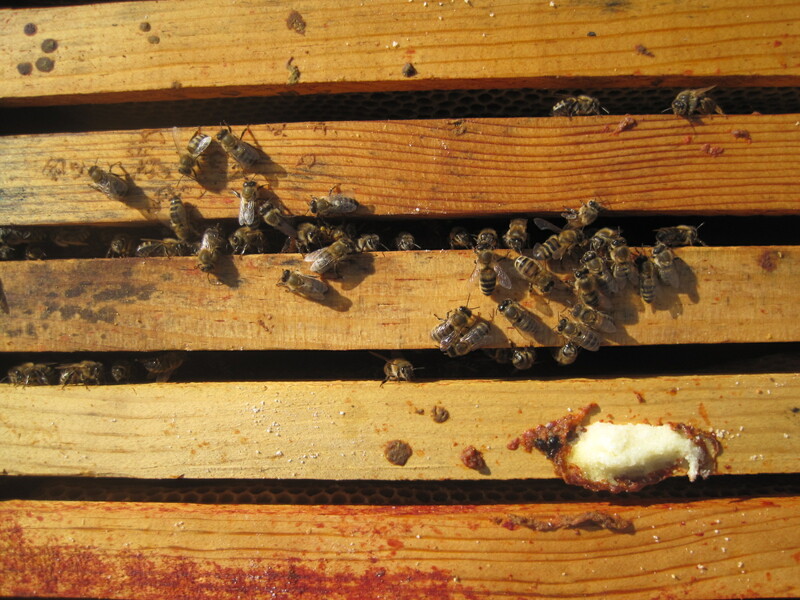 When I opened their hive, I was dismayed to find two frames of bees huddled towards the south side of the hive, lethargic and sad, queen-right but with no honey whatsoever. I did not want to chill what little brood there was, so I made a mental note of what to bring back on my next visit and closed them back up. 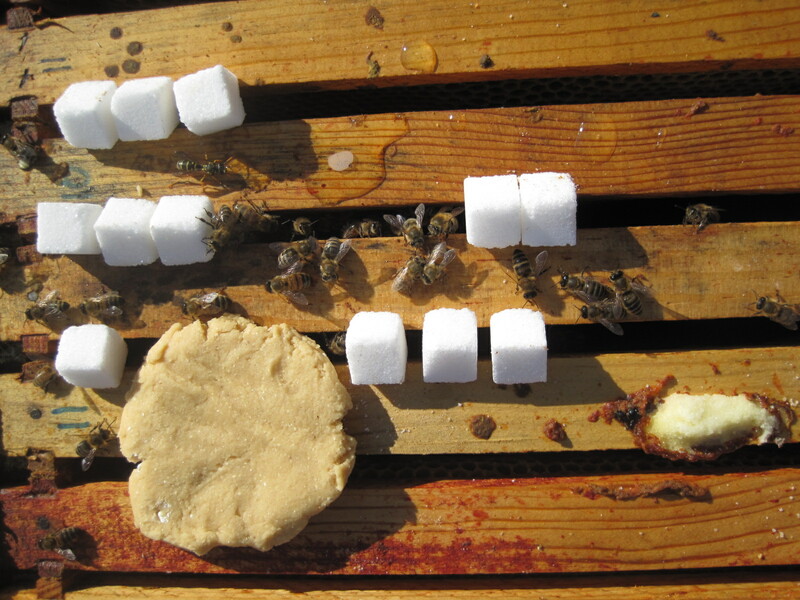 I returned with hard sugar (sugar cubes this time), a feeder with 1:1 syrup, and a protein patty. While I didn’t pull this colony completely apart to examine the bottom board, I can conjecture from the 9″ blank spot on the mite board I placed that the cluster was fairly large, perhaps starved, fell to the bottom, and remained there without enough undertaker bees left to clean up the mess. I will have to wait for our next spell of warm weather to see if my emergency measures will pull them through or whether I will be completing an autopsy by sending a sample to the bee lab in Beltsville. So what could I have done differently? This colony was so large in the fall that I wintered it in two westerns and a deep, as the cluster stretched across the lower two boxes. I think the weight of the extra box fooled me into judging the colony well-provisioned (it went from impossible to heft to merely difficult). I could have tried to equalize this hive with a weaker one, making it lighter and easier to evaluate. Another possibility is that this particular bunch of bees had a more Italian-style spring growth pattern. Italians are noted for a no-holds-barred spring build-up designed to maximize foraging capacity as soon as the nectar begins to flow–a risky strategy in a climate with extended cool wet springs. More conservative strains of honeybee (Carniolans or Russians) may not be able to make full use of that unusual April/May that offers weeks of sun and maple bloom (e.g., last year’s bizarre weather), but they typically don’t starve to death, either. If this colony survives, I should probably requeen with stock from a hive with more circumspect habits. What adventures are you having so far this spring? I took the hive apart and, since the bottom box (3 westerns=the hive body) was light I moved it to the top leaving the brood chamber intact. It was delightful to see the bees so clearly excited about the beautiful weather-lots of flying, pollen, and nectar. A happy hive means a great spring! I love it when reversing is so clear-cut and elegant! Congratulations on a well-wintered hive!